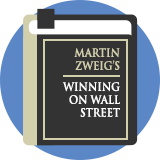 Martin Zweig - Reputed US growth money manager in the 1990’s & investment newsletter writer. Author of “Winning on Wall Street”.. Here follow a selection of stock screening strategies that we have modelled based on the writings of or about Martin Zweig. These strategies are not endorsed by the author.